Fidget Spinners. If you uttered this phrase last month, nobody would have any idea what you’re talking about. But if you asked your kids, they’d tell you that they had to have one. But just like the Radio Flyer, the Hula Hoop, and Furbee, Fidget Spinners have taken 2017 by storm and become this year’s number one “must-have” toy. Your kids want one because everyone else at school does. 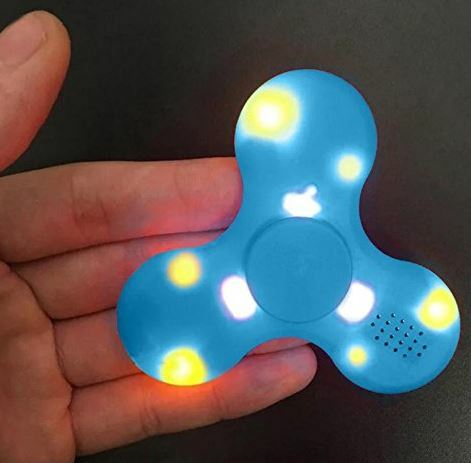 It’s a simple schoolyard game of “keeping up with the Jones.’” But if you do your research, you can get your kids something that nobody else has – a fidget spinner with a Bluetooth speaker built right in. Often, these entertaining little gizmos don’t cost much more than their non-electronic counterparts. Any many of them work just as well. In this roundup, we’ll be taking a look at the three best Bluetooth enabled Fidget Spinners. We’ll show you want each model has to offer, and then we’ll help you decide which one your kids will like best. As a prominent importer of Asian made toys and goods, Sumilulu is a popular choice for parents and children looking for affordable alternatives to locally made products. One of the main reasons we recommend this brand is safety. The media has recently brought a lot of focus to inexpensive toys that may contain lead, or other dangerous chemicals. Sumilulu may not be the cheapest option out there, but they sell exclusively toys that have received the appropriate safety rating – putting parent’s minds at ease. Physically speaking, the Sumilulu Bluetooth Speaker Fidget Spinner isn’t much larger than a standard model. There are six different designs available. If you’re looking for something simple, the white model will probably be your best bet. But Sumilulu has also released a number of bright neon colors such as blue, green, pink, and teal. If you’re looking for something very different, there is even a model that’s patterned with an electric design. 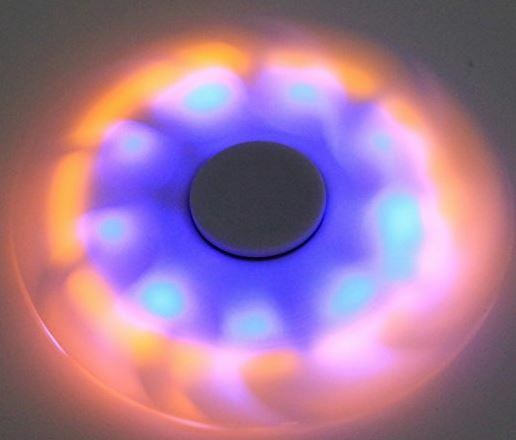 These spinners are certainly eye catching from the start, but as soon as you turn it on they come to life. There are two sets of LED lights inside, with the colors paired to match the outer case. These LEDs are mounted on cables the bounce and wiggle with the movement, creating a lively environment that you won’t find elsewhere. Overall, these spinners have a smooth, simple look. But still manage to capture the attention of anyone who uses it. Getting synced up with this Bluetooth spinner is simple. As soon as you turn it on, it will enter pairing mode. All you have to do is open the Bluetooth menu on your audio device, search for devices, and tap to pair. From here on out, whenever the spinner is turned on with your chosen audio source nearby, it will automatically pair. The built in speaker has 1 watt of power. It’s certainly not going to rock the room, but we were impressed with how loud and clear it was. Sound is clear, undistorted, and perfectly audible for a moderately sized crowd. This particular spinner was a little lacking in the low end, but this allowed it to achieve higher volumes with minimal distortion. 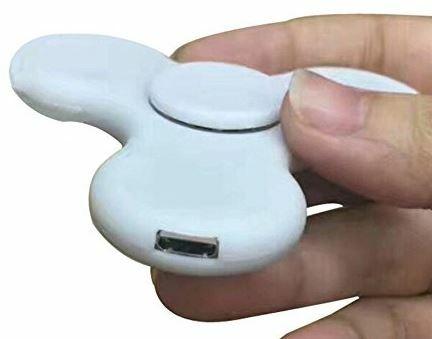 This spinner has a 70 mAh battery built right in. You can charge it using any standard micro-USB charger, and it only takes about 45 minutes to charge from empty to full. This battery will give you about three hours of music playback. One of the standout features of this spinner is the high quality materials it’s made from. All of the counterweights are made from aluminum alloy. This metal is safe, durable, and very easy to weight correctly. The end result is a spinner that spins for a long time, remains stable, and can keep up with the best of them. The plastic enclosure itself is made from a laser molded plastic resin. This allows the material to be well balanced. This balance means that even when the spinner is in motion, you can keep flicking it to have it spin indefinitely. With a number of innovative products on the market, Robiear is known for taking something common and adding their own unique twist. Their clover spinner is no different. Featuring three large pedals and a unique weighting system, this spinner looks different than anything else you’ve seen. What this unique design does is allow the manufacturer to use high end speakers, creating an audible environment you won’t get with any other spinner. While it might not be as lucky as a four leaf clover, this three leaf design definitely has it’s advantages. The counterweighted petals are aerodynamic and well balanced, ensuring that the Robiear Clover Fidget Spinner spins along with the best of them. The main difference between this and another spinner is found beneath the three metal speaker grills. Although all three of them are covered for balance, two of these contain high quality neodymium drivers. The plastic enclosure is available in four different colors. For those of you who favor a vibrant, eye-catching appearance, the red and blue spinners are a great choice. For something a little simpler, the metallic silver and gold models will stand out from the crowd. 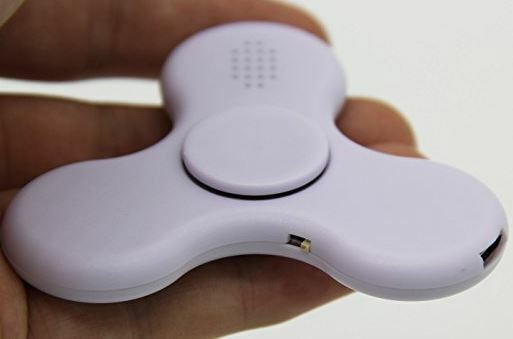 A standard micro-USB port is located on the side of one of the petals, while the raised center bearing makes it easy to hold your finger in place while flicking the spinner into motion. With any compact speaker, manufacturers are always fighting against physics. In order to make sound, speakers need to move air. The louder the sound, the more air that needs to be moved. Unfortunately, when you’ve got one tiny driver trying to produce a large range of high and low sounds, there is plenty of room for distortion. Robiear has a unique solution to this problem. What they’ve done is separate the high and low end across two separate drivers. The right driver is a compact rectangular model designed specifically to produce treble, while the other driver produces bass. The end result is a compact speaker that produces accurate, full range sound. The volume and clarity are both above average for the form factor. In most cases, the Bluetooth speaker is a simple additive to add another layer of entertainment to the toy that nobody can get enough of. But with this model, the speaker is good enough to be a legitimate way to enjoy your music. 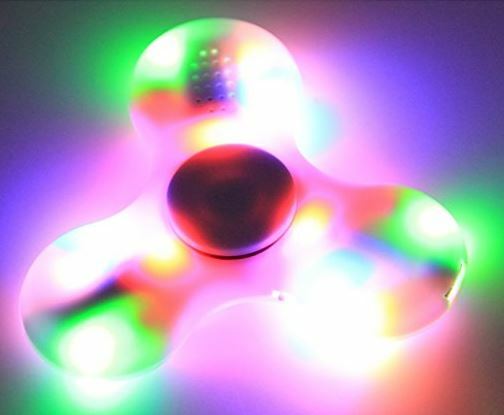 If you’re looking for a spinner that provides you with the ultimate light show, this is the one. Fangfei manufactured it to use high quality components, but tweaked the common design to add a few features that you won’t find elsewhere. 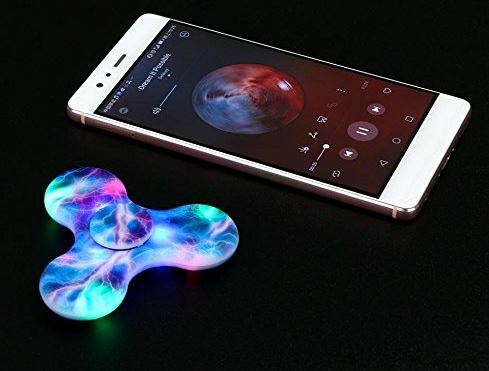 Depending on which model you get, the Fangfei Mini LED Bluetooth Speaker Fidget Spinner just may be the most unique looking model on the market. The enclosure has the same smooth plastic design that is common among other models. If you’re looking for something simple, the black and white models are, from the outside, indistinguishable from other options. You can also choose from a deep green or bright red color if you’re looking to add a splash of vibrancy to your purchase. But our personal favorite is the crystal model. 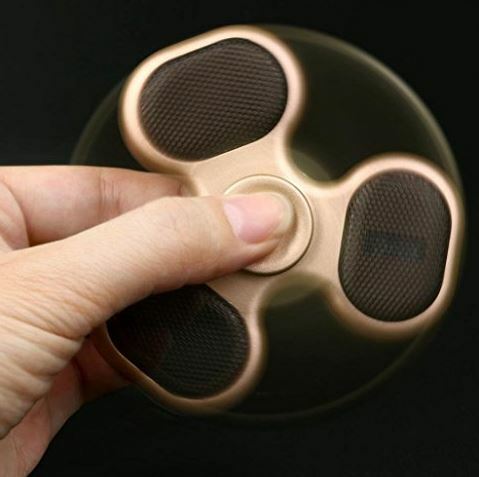 This spinner uses a transparent plastic that allows you to see all of the technology behind it. This design is a throwback to the early 90’s, when the coolest kid at school was the one with a transparent GameBoy. On one side, you can see the internal speaker. Another holds the battery. Finally, there is the micro-controller, the Bluetooth amplifier, and the compact metal antenna. 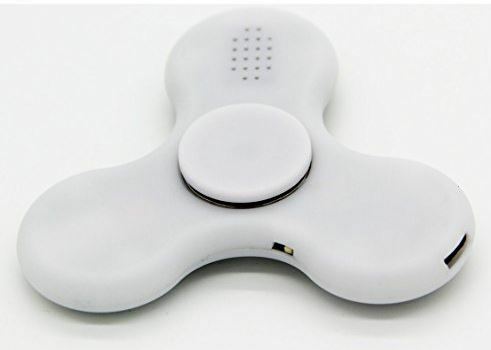 If your child is a budding techy, this cool looking spinner will let you show them all of the hardware inside. Once you turn it on, you’ll see the feature that sets this spinner apart from the others. There are several RGB LEDs inside. When in motion, it creates a geometric light show that is much more impressive than any other model we’ve seen. Featuring a single planar speaker, this Bluetooth spinner is capable of producing full-range sound from a compact package. The audio is clear, and has very little distortion. The 1 watt amplifier can drive the speaker to produce a surprisingly loud sound, although it is a little quieter than some on the market. We’d recommend this model for use indoors. Outside, the speaker feels a little quiet. But this more power efficient circuit allows the spinner to have the best battery life out of anything we’ve tested. The 70mAh battery might be the same type used in the other spinners we’ve reviewed, but with the more power efficient circuit you get a lot more battery life out of this model. It only takes 1 hour to get a full charge, but that gives you five hours of music playback time. 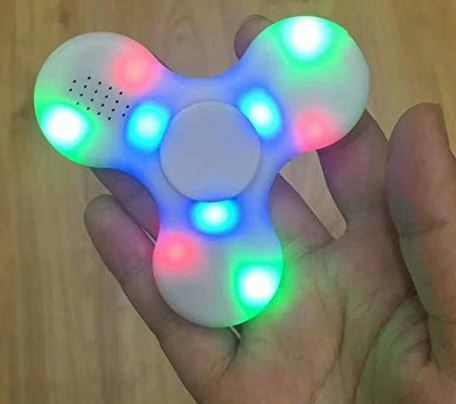 The weighting is a little lighter on this spinner, which makes its functionality similar to the non-Bluetooth models your kids are used to. Which Bluetooth Enabled Fidget Spinner is Right for Me? If your kids have been hounding you for a fidget spinner, any of these models will be sure to put a smile on their face. And once they find out that there is a Bluetooth speaker built in, they’re sure to be the coolest kids on the playground. However, there are a few differences between these models that could make one option a better choice than the other. The one you choose will depend on what you’re hoping to get out of the spinner. If your kids don’t have a Bluetooth speaker, it’d be a good idea to get the one with the best possible sound quality. 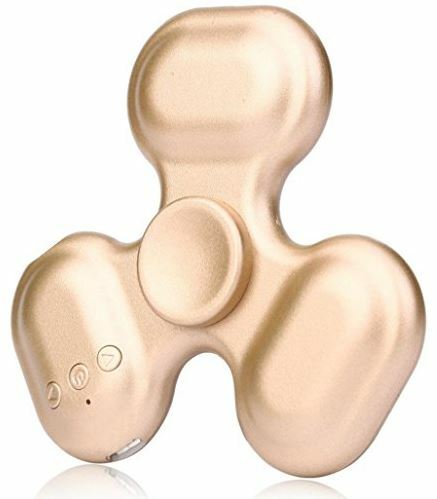 In this regard, the Robiear Clover Fidget Spinner is the best that money can buy. It’s got two drivers that split up the high and low portion of the sound, creating a more full-bodied sound when compared against other models. 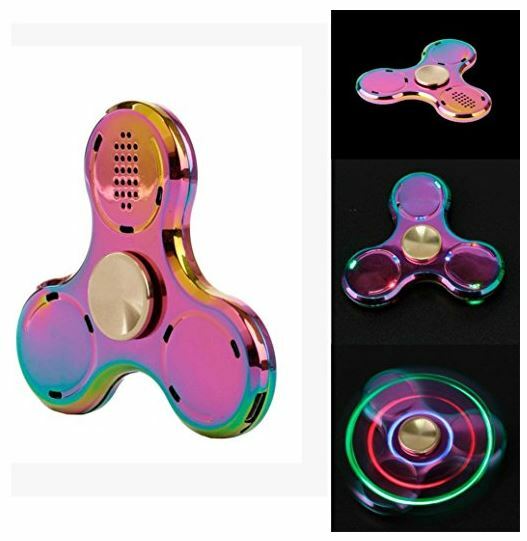 If you’re looking for a light show, the Fangfei Mini LED Bluetooth Speaker Fidget Spinner is the best choice. RGB LEDs play back pre-programmed lighting shows. When in motion, you get a cool geometric design that your kids won’t be able to keep their eyes off. Looking for a fidget spinner that is made from safe materials that don’t pose a health hazard? 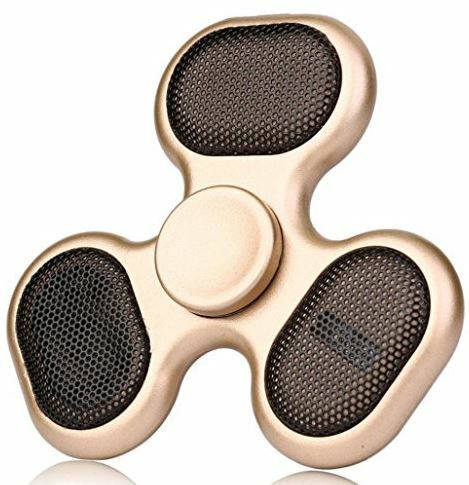 There is no better choice than the Sumilulu Bluetooth Speaker Fidget Hand Spinner. Not only do they use high quality materials, but the build quality on this model is unparalleled with any models that we’ve tried. For kids that play hard, this model will ensure that you’re spending your money on a lasting investment that won’t break easily. TechGuru is an expert in the field of computers, electronics, and the latest technology. Nerd Techy Copyright © 2019.